The PDC is a partnership between Chester FC Community Trust and Chester FC Academy that will provide increased opportunities for talented players to train in a professional environment designed to help them reach their potential. Players continue to train and play for their grassroots clubs with the PDC offering them additional coaching from experienced coaches in line with The FA’s four corner model and Chester FC Academy’s development principles. There will be opportunities to take part in fixtures with other PDCs and for players who display exceptional ability the PDC will provide a pathway into the Chester FC Academy. Jim Green, chief executive of the Chester FC Community Trust, said: “The PDC programme aims to give players the best coaching and environment to help them realise their full potential. “It provides opportunities for talented players to develop and improve with Chester FC coaches, and establishes a pathway for those players excelling for their grassroots clubs to be monitored with a view to progressing into the Chester FC Academy. The PDC will be based at Chester Catholic High School with sessions taking place on Friday evenings from 5pm to 6pm for Years 1 & 2, and 6pm to 7pm for Years 3 & 4 and Years 5 & 6. Assessment sessions will be held on Friday, November 11 and Friday, November 18. In order to attend prospective players can download and complete a registration form and return via email to community@chesterfc.com. Prospective players can register now and will be invited to attend an assessment session. Those successful at the assessment stage will be invited to the PDC to take part in a 12-week programme designed to develop player’s fundamental skills, technical ability and tactical understanding. The PDC works closely with Chester FC Academy, enabling coaches to identify and monitor talented players and creating a pathway for exceptional players to progress. There will be the opportunity for development fixtures against other PDCs and touring teams. For more information on the Chester FC PDC email community@chesterfc.com or call 07512 355396. 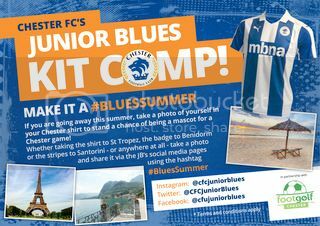 The Junior Blues are delighted to offer a fantastic completion, open to all Junior Blues’ members. We want to spread the Chester Football Club name far and wide and you can play a part in doing that. Going on holiday to Spain? A summer of fun in the U.S.A.? Or maybe just enjoying everything the U.K. has to offer? Get a snap of yourself in your Chester shirt while on holiday, and share it with us on our Facebook, Twitter or Instagram pages using #BluesSummer. Every entrant will be put into a draw and a name will be pulled at random. The prize? A fantastic mascot experience for the coming season. You will get to meet Jon McCarthy and his players before the game, have a tour of the ground and then get to lead out the lads before kick-off. we will also throw in two adult tickets. The closing date for this fantastic competition is Sunday 4th September 2016, so get those entries in. *By entering the competition you consent to us publishing your name and/or photograph if selected in our Newsletter, Magazines, Programmes or on our website or via any other method, including our social media channels. We will NOT publish any other personal details including addresses, telephone numbers, or email details or pass on any details to a third party without your Parent’s/Guardian’s written consent. Please note we do not have alternative prizes to those advertised. Draw will be made on Tuesday 6th September and winner will be notified by telephone or email. Selected game to be decided with agreement of Chester Football Club. Great News, every new member that has joined the CFU since 15/6/2014 can now collect their Membership card from the Ticket office. If you are an exile and would like yours posting out, please email info@chesterfc.com. Who are the Junior Blues?